The deadline to register to vote in Massachusetts in November’s election is October 17, 2012. The big day, Election Day, is Tuesday, November 6, 2012. See you at the polls! Watertown has posted the results of the town election of November 8, 2011. 16.65% of the 21,061 registered voters in Watertown cast ballots in yesterday’s municipal election. Incumbent councilors from Districts A, B and C ran unopposed and all were reelected. Angeline Kounelis, Cecilia Lenk and V.J. Piccirilli will be returning to the council. They will be joined by Kenneth Woodland who ran, without opposition, to fill the seat representing District D, currently held by John Lawn. Incumbents also won the four council-at-large seats. 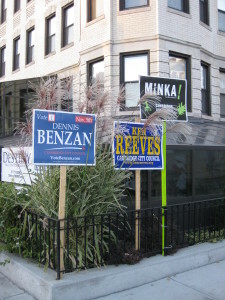 However, write-in candidate Michael Mandel, who ran an anti-Walmart campaign (this is the first I’ve heard about the possibility of Walmart coming to Arsenal Street – if I lived in Watertown Mandel would have had my vote), came in just 91 votes behind the next highest vote getter, Stephen Corbett. According to the Watertown Tab, Michael Mandel is considering filing for a recount. You would think his strong showing – given that he entered the race just a couple of weeks before the election – is a reflection of many residents’ sentiment about Walmart. Here’s what the town council members and candidates have to say about Walmart. Three seats were up for grabs on the Watertown School Committee. Eileen Hsu-Balzer won reelection. She will be joined by two new school committee members: Michael Shepard and Julie McMahon. Christopher Beach did not win reelection. Mayor McGlynn won a 13th term. Given that his opponent Anthony D’Antonio didn’t seem to be a proponent of the Green Line extension I’m relieved that McGlynn won. Medford will have one new face on the City Council – Richard Caraviello was elected to the council. Councilor Mark Arena failed to win reelection, falling short by just 37 votes. Incumbents Breanna Lungo-Koehn, Robert Maiocco, Paul Camuso, Frederick Dello Russo, Michael Marks and Robert Penta were all reelected. Turns out you can get a better sense of the Medford City Council on Youtube than you can on the city website. Search “Medford City Council” on Youtube and you’ll pull up quite the collection of videos, some hilarious, with titles like “Medford City Council – What Year is This?”, “Joe Viglione tells Medford City Council Off” or “Medford City Council Calls for a Battle”. Watch ’em and weep – or laugh. By far the most popular Medford City Council video is this one of City Councilor Paul Camuso, titled “Perfect Boston Accent“. It’s been viewed over 650,000 times. Now I have to say – Councilor Camuso’s accent doesn’t really leap out at me. I hear worse (better?!) all the time. See what you think. 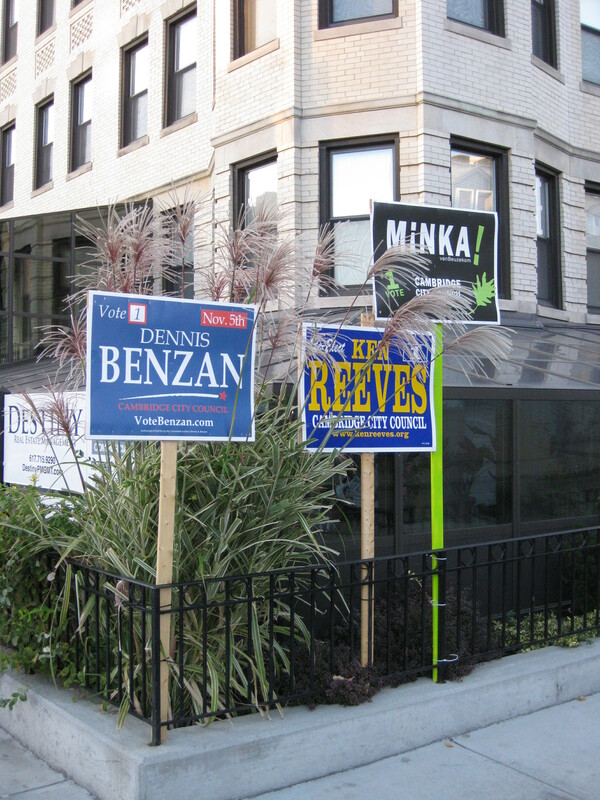 There were a lot of sign waving supporters on Somerville street corners on election day. Wondering who won the Board of Alderman and school committee races? Here are the preliminary Somerville election results for the municipal election on November 8, 2011. Somerville publishes the unofficial election results. Races aren’t final until the absentee, overseas and other provisional ballots are counted. The posted unofficial results are based on the 9,071 votes cast and counted at the polls. Since most seats were not contested, however, there’s not a heck of a lot to report. Mayor Curtatone and all seven members of the School Committee ran unopposed and were reelected. The Board of Alderman races resulted in just one new face among the eleven members. All four of the Board of Aldermen members with at-large seats won re-election: John Connelly, Dennis Sullivan, William White and Bruce Desmond. William Roche (Ward 1), Maryann Heuston (Ward 2), Sean O’Donovan (Ward 5) andRebekah Gerwitz (Ward 6) ran unopposed and were re-elected. Thomas Taylor was re-elected to represent Ward 3, beating Stephen Delani. In a bit of a squeaker in Ward 7, Robert Trane was re-elected, beating challenger Katjana Ballantyne by 40 votes, 1068 to 1028, according to the unofficial tally. In Ward 3, Alderman Walter Pero did not run for re-election. The unofficial tally shows Tony Lafuente beating Christine Barber in that race by 857 t o 623.